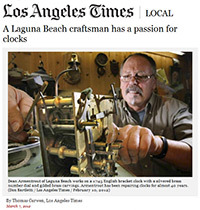 With over 30 years of experience, Dean Armentrout of Dean Armentrout Antiques specializes in the repair, restoration and sales of fine antique clocks from all over the world. A graduate of West Dean College in Sussex, England, Dean received the highest grade attainable upon completion of the one year course in Antique Clock Restoration. In addition, he was made a Craft Member of the British Horological Institute in 1986. Other affiliations include longtime memberships in the American Watchmakers-Clockmakers Institute (1980) and the National Association of Watch and Clock Collectors (1976.) The combination of technical skill and in depth knowledge of antique clocks makes purchasing a piece from Dean Armentrout Antiques a rewarding experience. 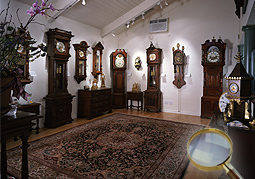 The premises include a fully equipped horological repair workshop as well as a pleasant showroom displaying a wide range of high quality antique clocks. In the workshop a wide range of repairs take place such as fabricating missing parts, dial restoration, escapement repair,wheel cutting, cleaning and polishing. Laguna Beach, Laguna Niguel, Dana Point, San Clemente, Newport Beach, Costa Mesa, Laguna Woods, Lake Forest and Aliso Viejo.